With dual i.LINK IEEE-1394 and single HDMI outputs, Sonys flagship DVP-NS9100ES delivers exceptional video and SA-CD multi-channel sound. The unit features 720p/1080i up scaling, 14bit/216MHz DAC with NSV providing exceptional picture quality and Super Audio D/A converter (4 x 2 channel) for 5.1 plus 2 channel analog outputs for crystal clear audio. 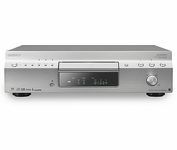 The single-disc DVD/Super Audio-CD player provides powerful connectivity options and image/audio adjustments with RS-232C interface, infrared input, Sonys Precision Cinema Progressive and A/V Sync. The unit can play back multiple disc formats, including DVD-R/-RW/+R/+RW, MP3, JPEG, CD-R/-RW, VCD and SVCD. Hi-end DVD/CD/SACD machine with great audio capabilities for both CD and SACD. Works, buttons & design style are all faboulous as well. Even the time needed for read in the discs is quite good. Be aware of worn-out disc drive unit / optical unit though, as these problems are common in universal players, with Sony also concerned. But mine still works without failures. Desription of the CD sound : very natural sence of instruments and voices with excellent imaging and not too crisp. Highs are very clean, mids voluminous and round while bass is probably the weekest part (not very tight nor very deep) but still sounds the part for its price category. If there is a "better" competitor for the audio part at this price level it's the Denon DVD-3930, which sports an even better picture than the Sony, but falls short in terms of design. And I've read a lot about disc drive problems with the Denon. Generally, the Sony features excellent SACD sound and a fantastic picture, too. If you find this Sony new or used in good overall condition for a nice price, don't hesitate ! But make sure you can test the disc drive / optical functions for a sufficient time !